Purchasing of nail gun requires lot of research. The market is flooded with a wide variety of nail guns making selection of the one best suited to the needs can be quite daunting. Also, there is a constant fear of the nail gun ending up lying in corner as the buyer is not able to find many uses of it. So, the key to maximizing the benefits lies in the best nail gun that is easy to use and good support for the work. • Depth adjustment feature: Some nails are to be shot deeper than others. So, one of the classic features worth looking for in a finishing nail gun is – depth adjustment feature. This feature allows the carpenter to use same finishing nail gun for different kinds of surfaces and also for different levels of strength. Instead of having different nail guns for different levels of depth, it is better to pick the nail gun that can be adjusted for depth. • Presence of gauge adjustment feature: Flexibility of setting the gauge dimension works the best for the DIYers who look for single gun to fix nails of different sizes. The best nailer for a DIYer will be one that can accept different nail sizes and has easy way of switching between the nails with varying dimensions. • Protective guards: Whenever crushing through the wood or metal is involved in the job, the instances of any tool getting clogged due to flying debris can occur commonly. This may require stopping the work and clearing the tool off debris again and again. So, if there are any protective guards provided for keeping the tool safe and functional even in the presence of flying wooden debris, the work can be done faster and the frequent servicing can also be avoided. • Presence of oriented exhaust: While working with nail guns, the carpenter has to ensure that its exhaust is away from him for safety reasons. Also, the presence of exhaust near the user can interfere with its visibility as lot of dust will come in between the target and the carpenter. So, there are finishing nail guns that come with adjustable exhaust feature so that the user can tackle different conditions simply by orienting the exhaust to a suitable direction. 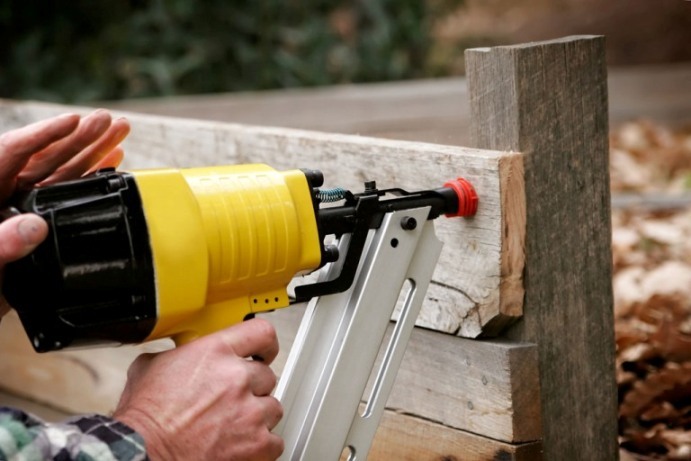 • Protective storage: The nail gun can become exposed to rusting, and other weather related deterrents that can ultimately reduce its shelf life. Also, without a portable cover, the nail gun can become victim of manhandling too or may get dropped during going from one location to another. All such mishaps can be avoided if the nail gun comes with a sturdy and easy-to-carry nail gun cover. So, when you have made clear all these points in mind, you can surely assure of having a nail gun that delivers better shelf life and maximum usage. Apart from these pointers, refer to finish nailer reviews that outline pros and cons of the trending nailing equipment.